Hibiscus-Vodka Cocktail with Mint and Jalapeño; refreshing and downright gorgeous. 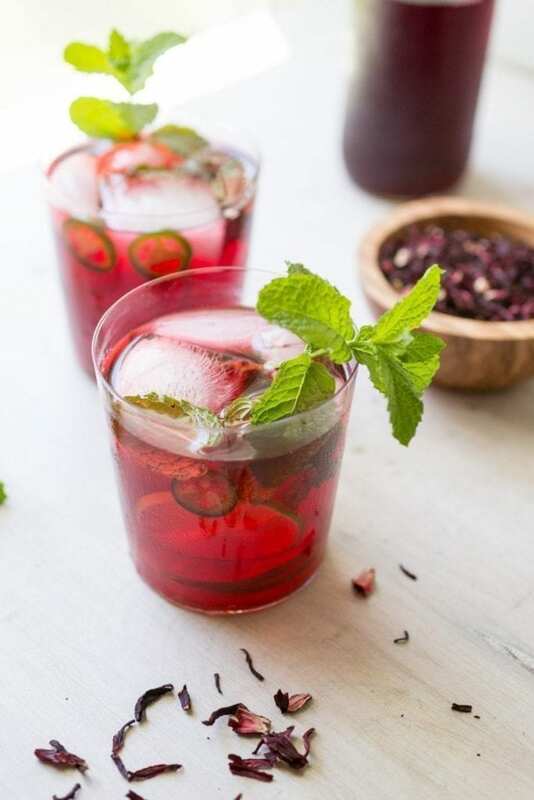 This gorgeous cocktail combines homemade hibiscus syrup with lime, vodka (or gin), and a few slices of jalapeño and mint. Poured over ice, it’s just what you want on a hot summer day. I’ve mentioned before that for someone who has lived her entire life on land, I’m extremely concerned about getting scurvy. The fact that my preventative measures always happen to be delicious, tart cocktails is purely just coincidence. Odd that. Because I’m also concerned about you, dear reader, I’m writing you a prescription* for drink at least two of these cocktails a week, all summer long. You’re welcome. *I’m not a doctor and you probably (definitely) shouldn’t listen to me. 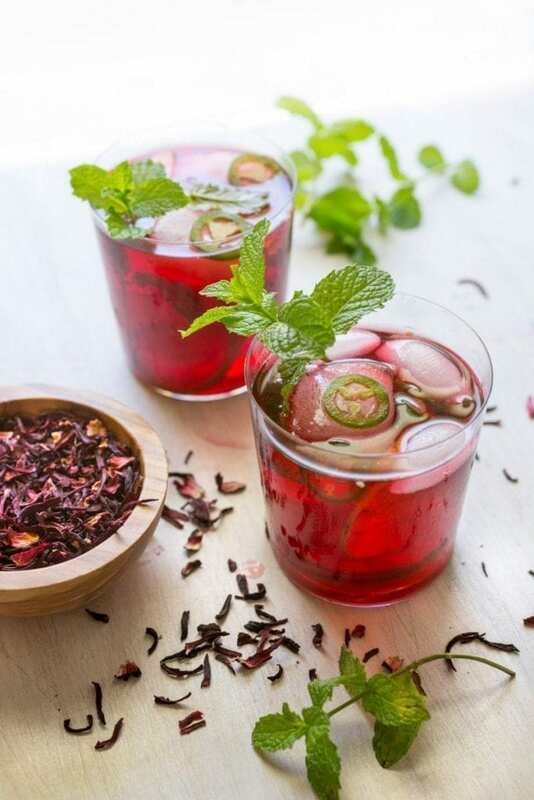 The main component of this drink is hibiscus syrup. This is nothing more than dried hibiscus flowers steeped in hot water and sweetened with sugar (or any sweetener of your choice). It’s as easy as making a pot of tea, and you can keep it in a clean jar in the refrigerator for weeks. You can buy the flowers at most health food stores, or online. In fact, Matt bought a huge bag from Amazon the same day that I bought some from the bulk bins at our local Nature’s Pantry so you can expect quite a few hibiscus recipes on the site this summer. Luckily the tea (really it’s an infusion) is a beautiful, deep magenta drink that has a tart, floral flavor. It’s delicious on its own or with a splash of club soda, though my favorite way to use it of course is in cocktails. 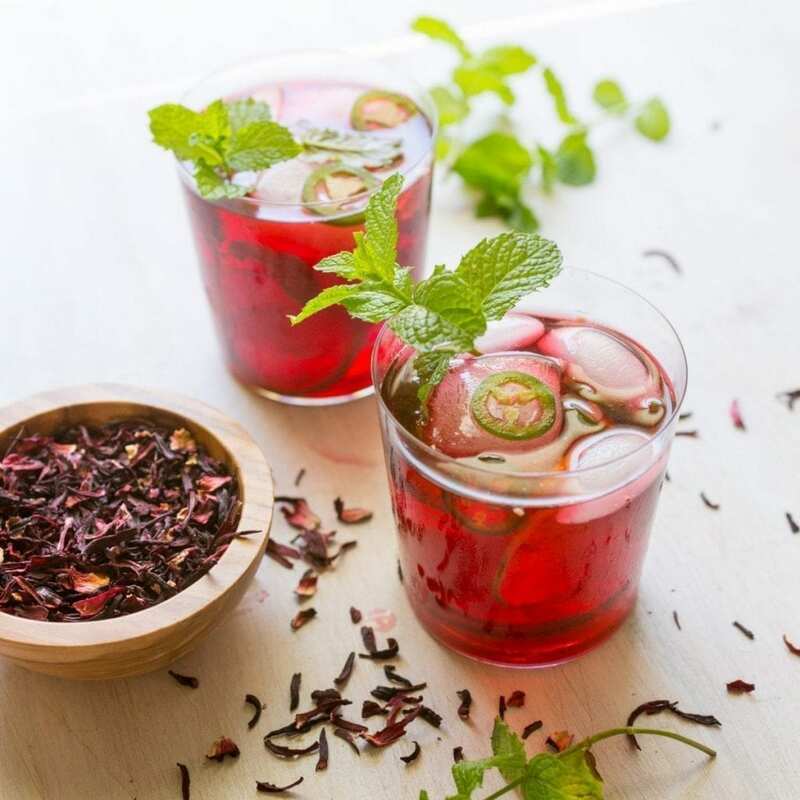 All scurvy jokes aside, hibiscus truly is practically health food. It’s rich in vitamin C, minerals and various antioxidants, and there’s even some clinical studies suggesting that consumption may lower blood pressure. I’m sold. Plus, just look at it! Who wouldn’t want to drink this? Hibiscus has a tart, almost cranberry-like flavor. Giving the mint leaves a little twist releases the oils and gives the drink a light mint flavor. I was inspired by this cocktail from Bon Appétit (which looks amazing). But finding myself with neither tequila or pineapple, I whipped this up instead. Really it’s the flavor-bomb garnish of fresh mint and sliced jalapeño that gets me all excited so I’ll use it in my simplified vodka version. The result is a tart but balanced drink. The cool mint and spice from the chili give it depth. Poured over ice, it’s cold and perfectly refreshing. So if you like your friends and don’t want them to get scurvy, be a pal and make up a pitcher! *A note about sweetness. I tend to like my drinks on the tart side but if you want a sweeter drink, add an extra tablespoon of sweetener to the mix (split between 2 drinks). A couple of slices of jalapeño add just a hint of spice. 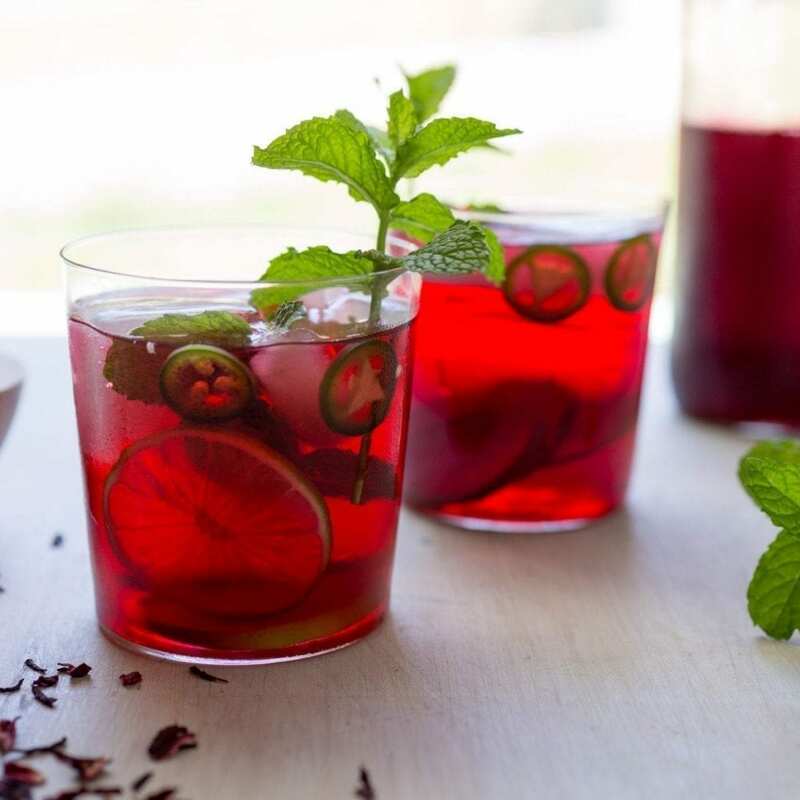 This gorgeous cocktail combines homemade hibiscus syrup with lime, vodka (or gin), and a few slices of jalapeño and mint. 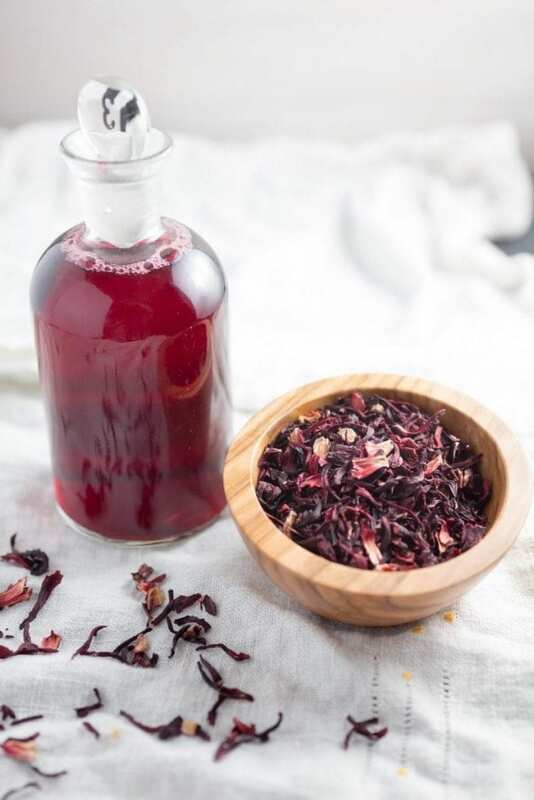 Make the hibiscus syrup: In a saucepan, add ½ cup sugar to 3 cups water and bring to a boil. Add dried hibiscus and stir until sugar is dissolved. Remove from heat and let steep for 15 minutes. Strain through a fine mesh strainer into a jar or glass container and chill until cold (about 30 minutes). Can be made up to 2 weeks ahead. Make two cocktails: Add ice, chilled hibiscus syrup, lime juice, sugar (if using) and vodka to a cocktail shaker and shake vigorously to combine. Add ice to two highball glasses and divide into each glass. Twist a few leaves of mint and add to each glass along with 2 or 3 slices of jalapeño, and a lime wheel.